In a recent interview, Clive Weighill, who is the chief of the police force in Saskatoon, the president of the Canadian Association of Chiefs of Police and a veteran of the August raids, stated that the war on marijuana has not worked at all. Thankfully, times are changing in Canada and all over the world, as more countries are already discussing about how to regulate cannabis and Canada might be fully legalizing this herb very soon. We have talked about this before, but until now, Canada is only offering medical cannabis to certain people in their country. Now, the new Liberal government, has promised to make some changes quickly and that they are working on legalizing marijuana for general use. If this happens, Canada could join a group of 20 countries, which are working on ending cannabis prohibition at a national level. Eugene Oscapella, who is a law professor at the University of Ottawa and a legal marijuana advocate stated, "our system is badly, badly flawed! I keep asking myself a question that I have been asking for 30 years: Could we have done a worse job if we tried? Could we have found a way to create a more dysfunction than we managed to create?" It is more than obvious that the war on marijuana has failed worldwide and that prohibition needs to end today. Hopefully the new Liberal government in Canada will fulfill their promises and legalize cannabis for regular use nationwide. 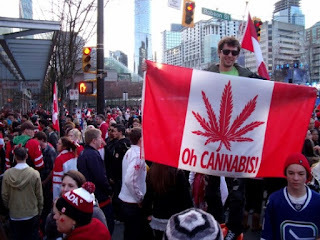 Please remember to share and like this blog post, so that more people can read about Canada ending marijuana prohibition for good. You can also register for our free newsletter, by leaving us your email in the box to the right, so we can send you more interesting news about marijuana and some special offers related to this herb.